Gwyn ap Nudd and Gwyddno Garanhir. 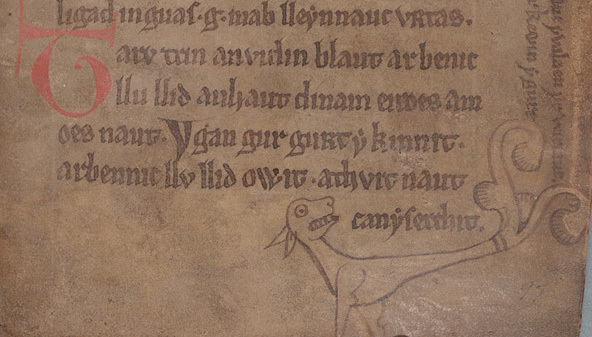 This conversation appears in a manuscript collection known as The Black Book of Carmarthen which is a collection of copies from earlier manuscripts made by a monk in Carmarthen in the Thirteenth Century, some of which are verses which may have originally been embedded in lost prose sagas. As with much early Welsh verse some parts of it are difficult to interpret and the only easily available version in English is that contained in Skene’s Four Ancient Books of Wales, a pioneering translation which is now regarded as flawed. I’ll provide my own attempt to translate it during the course of the ensuing discussion based on consulting modern editions and commentaries in Welsh. There are some uncertainties expressed by careful modern scholars and I have taken note of these while also venturing to suggest interpretations which they do not explicitly give but which are implied by their commentaries. The conversation takes the form of series of englynion, each three-line englyn conforming to the syllabic and metrical requirements for the type of englyn used with apparent exceptions usually ascribed to faulty manuscript copying. The requirements of the englyn form would have determined the precise choice of words and expression and it’s necessary to be sensitive to that process when deciding on possible meanings of uncertain phrases. The exchange follows a conventional format to begin with of a defeated warrior asking for protection from his attacker. But as, in this case, the conversation is between an historical character and a mythological character it soon develops into an enquiry into the nature of Gwyn ap Nudd which implies his coming from the Otherworld as a harvester of the dead. It is likely that it was not necessary to be explicit about this for readers or hearers of the poem and the nature of these poems is anyway that they are usually elliptical rather than explicit. A typical feature of one of these conversation poems is that there would be a balanced exchange between the two parties and this is how this poem begins. But it then develops into a monologue from Gwyn with the occasional interjection from Gwyddno. A problem here is that the manuscript does not indicate who is speaking and although this is often obvious there are one or two places where it is not. The final section of the poem as published by Skene is often detached by modern scholars who profess themselves uncertain if it belongs to the exchange although there is no indication in the manuscript of a new poem beginning and as this is usually indicated by a larger coloured capital or ornamented letter. I’ll discuss below another reason why I think it should be regarded as a continuation of Gwyn’s monologue. Of trust unfailing, who will protect me? You who ask shall have protection. Where is the land from which you come? Many heads pierced by spears. Tell me, great one, of your descent. The lover of Creiddylad, daughter of Lludd. Hurrying to battles in Tawe and Nedd. Where the tide ebbs fiercely on the shore. I saw battle at Caer Fanddwy. Violence inflicted by the honoured and fair. His horse is clearly a kindred spirit, calling him away to battles elsewhere. So we begin to get the sense of Gwyn as one who is called to wherever battles are raging, his function as Lord of the Dead, harvester of souls, becoming apparent. ‘Tawe’ and ‘Nedd’ are both rivers in South Wales. But he says it is not to the Tawe nearby he is called but to one far away. Where this might be is made clearer in the next two verses where he refers to Caer Fanddwy a place in the Otherworld mentioned by Taliesin in the poem Preiddeu Annwn, one of the forts in Annwn raided by Arthur (‘Save seven none returned from Caer Fanddwy’). So not only is Gwyn clearly an Otherworld character but he performs the task of Lord of the Dead, attending battles in that world too. But while he was previously portrayed as being victorious in this role, in the Otherworld he is sorrowful. As swiftly as cut reeds to the ground. Dormach he is, who was with Maelgwn. There is some uncertainty about the name Dormach. The scribe had originally written Dormarch but the second ‘r’ has been removed and a space left in the manuscript. It is, however interesting that he belonged to Maelgwn as he had a legendary pack of hounds referred to by later Welsh bards. Gwyddno, of course, was father of Elffin who discovered Taliesin in a weir. He was lord of the land drowned in the legend of Cantre’r Gwaelod. More of this in a later post but it is interesting to note here their connection in legendary history. Dormach rednose – why stare you so? Your wanderings in the firmament. The reading of the final line is difficult, but interpreting it in the way I have allows for a reference to the Wild Hunt, and an indirect reference to Gwyn’s role as its leader. When ravens croaked on gore. When ravens croaked on flesh. I live on; they are in the grave. I live on; they are dead. *Here the manuscript reads ‘I was not there’ (‘Ny buum’ instead of ‘Mi awum’) but it is likely that this is a scribe’s mistake. And so finally we may note the characterisation of Gwyn in folklore as the leader of the Cwn Annwn and so the Wild Hunt and another of the references to him in Culhwch and Olwen where the giant Ysbadadden tells Culhwch that he can never hunt the Boar Twrch Trwyth without Gwyn ap Nudd who “contains the nature of the devils of Annwn”. This is the burden he takes upon himself. In the medieval Life of St Collen, this Welsh saint is said to be lured by Gwyn – described as King of Annwn – into his fortress, but the saint throws holy water over him. In a medieval Latin text advising the clergy how to deal with superstitions an addition was copied in by a Welsh monk referring to Gwyn ap Nudd and his “concubine” in the context of love trysts in the woods, a not uncommon theme of medieval Welsh poetry. There are various passing references to him by the medieval Welsh bards, usually in the context of being lost in the mist and encountering Gwyn or the Cwn Annwn. In the view of Idris Foster[*] his original character was lost in some of these later references to him which simply see him as a leader of the Tylwyth Teg. He describes a number of “fluctuating descriptions” ranging from fairy to devil, but concludes that underlying these “there was one basic conception which was decidedly old – that of Gwyn as the magic huntsman”[*]. B F Roberts ‘Ymddiddan Gwyn ap Nudd a Gwyddno Garanhir’ in Astudiaethau ar y Hengerdd ed. Rachel Bromwich & R Brinley Jones (Cardiff, 1978). [*]Idris Foster in Duanaire Finn quoted by Brinley Roberts in Gwyn ap Nudd Llên Cymru XIII pp 283-289. Many thanks for your hard work on this translation and for making it available to the public. Particularly interesting to me, which we don’t find in Skene, is the naming of Gwyn’s horse as Carngrwn, finding out he’s a stallion (‘his bridle’) and that he’s white (in contrast to Du Y Moroedd ‘The Black One of the Seas’). Also of interest is the horse wants to pull away to battles in the Otherworld. I’d intepreted the ‘other’ Tawe as the Tawe in Scotland. The location of the other Tawe in the Otherworld is not certain, though of course the following reference to Mandwy is. ‘Tawe’ [Tafwys] has the same root as other rivers like the Taf (and the Thames). I don’t know which Scottish river might be implied but it’s always wise to be alert to references to ‘The Old North’ in early Welsh poetry and the Otherworld may well have been thought of as being located there. This is a link to Heron’s translation and interpretation of ‘The Dialogue of Gwyn ap Nudd and Gwyddno Garanhir,’ found in The Black Book of Carmarthen. This dramatic dialogue is one of the earliest pieces of known literature featuring Gwyn ap Nudd, who appears as a divine warrior and gatherer of the battle-dead. Heron has undertaken an important task, as the only translation currently available to the public on the internet is William Skene’s (1868), which is both dated and considered flawed. His hard work and understanding of this poem on historical and mythic levels is highly appreciated. Thank you so much for posting your translation. Really fantastic stuff! I can’t help but also notice the similarities to Woden/Odin as chooser of the battle-slain–not saying they’re the same god by any means, but it’s a fascinating parallel. There is also a River Taw in Devon flowing from Dartmoor to the sea at Appledore where it first join the River Torridge. @Catriona : yes there are clearly parallels with Odin in this and in some other ways. God ‘equivalences’ are complex and rarely one-to-one as you say, with different overlapping aspects of the characteristics of different gods in different cultures. This is a fascinating topic in its own right. @Janet : yes that’s another example. Funny how river names seem to reduce to a very small range with several different rivers across Britain owning the same name or a closely related one. My first thought about the dog was that perhaps he was referring to the Dog Star, Sirius. Interestingly, according to Wikipedia, Sirius was thought by the Babylonians to represent an arrow; then the Greeks changed it to a dog, possibly belonging to Orion. The Arabs, too, saw it as a dog, calling it The Dog of the Giant, while the Chinese called it the Wolf, denoting invasion and plunder. Interestingly, there are two red giant stars in this constellation, one or both of which may have been seen as the dog’s eye(s). All this leads me to wonder whether Orion may be synonymous with Gwynn, and Canis Major (and possibly Minor) were his dogs in the Wild Hunt? I also wonder whether the next verses are spoken by Sirius, and whether that constellation in fact did shine down on the deaths he mentions – and perhaps not on the one where the scribe wrote that he was absent? There is a line in Cad Goddeu, which gets translated many different ways, but which reads Bum ser gan gynben, and most simply and literally translates as “I was stars with dogheads.” Sirius is not only connected to dogs and wolves in various cultures, but also to cynocephali/dogheads in several, and because Sirius has its heliacal rising in the late July/early August period, which is known as the “dog days” in many Indo-European cultures, I think it likely that the reference there is to Sirius. I find your suggestion intriguing, certainly! @ Karen ; That’s an interesting interpretation. Certainly bringing in astronomical symbolism makes sense of the references to ‘wandering in the firmament’. Gwyn as Orion? And the dog as Sirius? This would transfer the context to Classical and pre-Classical mythology as you indicate, but who knows what layers of association lie beneath the stories of the post-Roman Brythons? This is certainly something to ponder.